Four-time Olympic gold medal winner Sir Matthew Pinsent says Cornish rower Annabel Vernon can push for the top prize at the London 2012 Games. Vernon currently rows in the British women's quadruple scull, who won at the third and final World Cup event of the season in Lucerne last weekend. Pinsent told BBC Cornwall: "There's no doubt Annie is world-class, she's been world champion several times. "There's two years to the Olympics, but it would be a fantastic to win." Pinsent added: "We haven't won a women's gold medal in rowing before, so that would be a worthy aim at London 2012." Vernon, 27, was joined by Katherine Grainger, Anna Watkins and Beth Rodfrod in the British quadruple scull to take the gold at last weekend's World Cup event in Lucerne. The victory saw the British four gain revenge over Germany, who had beaten them in Munich's World Cup event three weeks previously. Vernon, who was born in Wadebridge and won silver in the quadruple scull at the Beijing Olympics, is now set to compete at the Rowing World Championships in New Zealand in October. 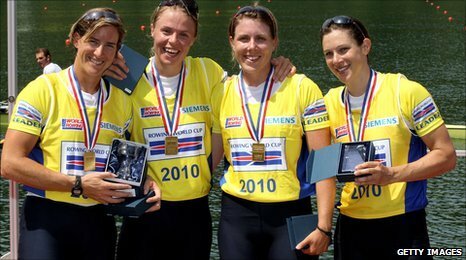 And with London 2012 looming, Pinsent said her life would now be wholly dedicated towards winning on home soil. He said: "She'll be out on the water for probably a minimum of three, maybe a maximum of six hours a day. "They'll also be weight training, dietary advice, conditioning and technical work. "The days of being part-time and turning up at the Olympics and wining a gold medal are long gone, that's why it means so much to people." With the title of Olympic champion bestowed upon him four-times between 1992 and 2004, Pinsent is in a better position than most to understand the demands needed to succeed at the highest level of the sport. He said: "Being world-class doesn't mean being Olympic champion. "Some people win an Olympic gold medal almost out of nowhere in their career, and it might be their best result by a mile. "But there will be many people who go years and years winning world championships and everything else and never winning a gold, so it's not a straight forward thing to win a gold medal."